Mathieu, Joe. Very Good. The Tooth Book (Bright & Early Board Books) by LeSieg, Theo. Glued binding. Paper over boards. 24 p. Contains: Illustrations. Bright & Early Board Books. Intended for a juvenile audience. Mathieu, Joe. Very Good. 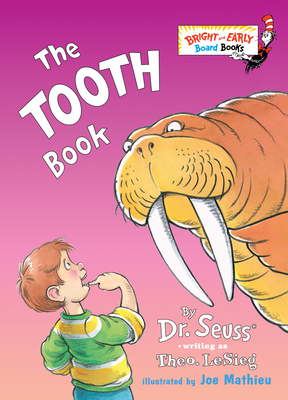 The Tooth Book (Bright & Early Books (Hardcover)) by Dr Seuss. Picture book. Sewn binding. Cloth over boards. 48 p. Contains: Illustrations. Bright & Early Books (Hardcover). Intended for a juvenile audience. Mathieu, Joe. Good. The Tooth Book (Bright & Early Board Books) by LeSieg, Theo, 2003-06-24. Glued binding. Paper over boards. 24 p. Contains: Illustrations. Bright & Early Board Books. Intended for a juvenile audience.